Open House #2 Meeting Materials and Presentation – CLICK HERE. Welcome to the website for the Midtown Congestion Relief (MCR) Planning and Environmental Linkages (PEL) Study. The Alaska Department of Transportation and Public Facilities (DOT&PF) will use this site to keep you informed about study development. Please refer to this site for updates, documents, announcements of public meetings, and to make a comment or suggestion. What is a PEL Study? This approach leads to streamlined evaluation and documentation during the National Environmental Policy Act (NEPA) process. For more information, click on the links below. 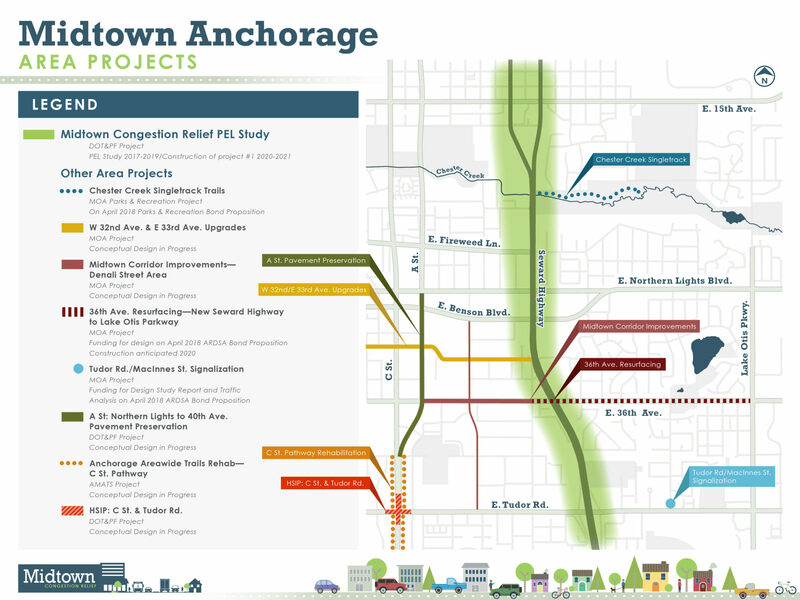 The MCR initiative is focused on the area surrounding the Seward Highway corridor from the Tudor Road interchange to approximately the 20th Avenue intersection through Midtown Anchorage. The intersections in this corridor have some of the longest delays and highest crash rates in the state. Traffic along this corridor is expected to roughly double in the next 20 to 30 years and, without significant improvements, congestion will increase dramatically in the Midtown area. The Seward Highway also creates challenges for vehicles and non-motorized traffic trying to cross from the residential area on the east to the commercial area on the west. 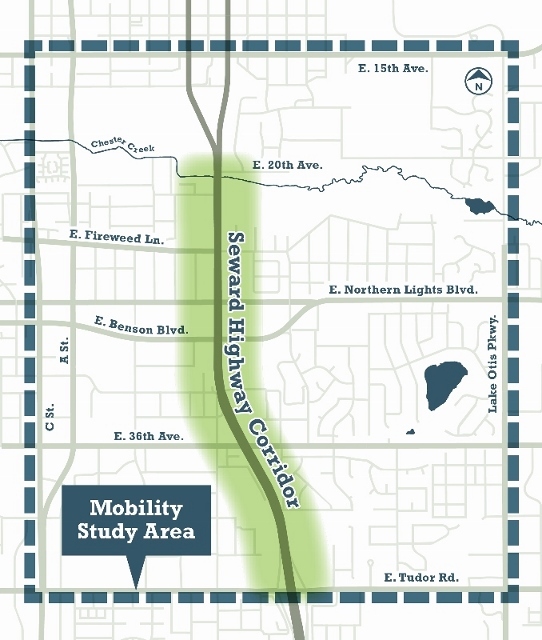 The MCR study area has a long history of unfinished projects that similarly sought to address traffic congestion issues on the Seward Highway where it transitions from a controlled access freeway south of Tudor Road to a slower speed major arterial road north of 36th Avenue. This effort represents a fresh start in the study area to more comprehensively develop and evaluate concepts to streamline the future environmental, design, and construction process. The MCR PEL Study will begin with a traffic study to evaluate the inter-related issues surrounding the closely-spaced, signalized intersections in Midtown Anchorage. Following completion of the PEL Study, DOT&PF will conduct design, environmental evaluation and NEPA documentation, and permitting activities to construct the highest priority project or projects. The effort is state-funded but will follow the federal process in anticipation of federal funding for plan implementation. Email will be the primary communication method for this project. To join the project email list, click below!